Til flowhastigheder op til 10.000 ml/min. FMA3100 Series mass flow sensors represent a breakthrough in mass flow sensor technology. State-of-the-art electronics, a compact mechanical design, and mass production tooling concepts are combined into one high- performance, cost effective product. The gas flow sensor is suitable for many OEM applications. A 0 to 5 Vdc linear output is standard. 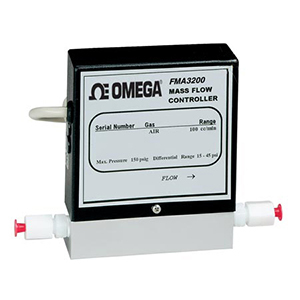 Using the basic FMA3100 thermal mass flow sensor, the FMA3200 mass flow controllers offer accurate, stable control of gas flows in a compact package. In power-off mode, the flow control valve is closed with a minimal leak rate. This cost-effective controller is ideal for many OEM applications, with a 0 to 5 Vdc linear output and a 0 to 5 Vdc control input. The FMA3300s combine the features of the FMA3100 with an adjustable 3½ digit LCD digital display meter for viewing flow rate in engineering units (i.e., mL/min or L/min). These compact flowmeters have proved effective in many laboratory applications. Noter: Comes complete with operators manual. For optional NIST traceable certification with four points, add suffix "-NISTAIR" to the model number, add $350 to price. *Specify gas and inlet/outlet pressure. Calibrations done at ambient temperature only. **Flow ranges stated are based upon dry Air or Nitrogen as a standard. For other available gasses, (carbon dioxide, helium, argon, hydrogen, methane, oxygen), add the gas signature as a suffix to the part number; add $175 to price.